In this second issue of 2013 our newsletter we focus on training and capacity building. 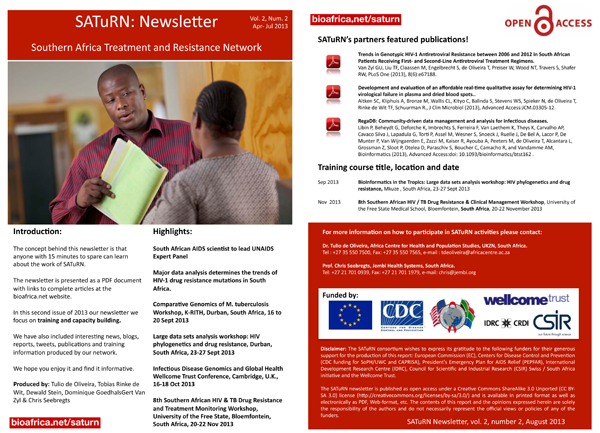 We want to let you know that we have finalized the organization of our annual meeting (8th Southern Africa HIV &TB Drug resistance Workshop, 20-22 Nov 2013, Bloemfontein, South Africa) and remind you that the deadline for applications is on 10 September 2013. Please do not forget to apply! We have also included interesting news, blogs, reports, tweets and publications produced by our network.